The Deep Zoo is a seed! From this seed come our initial impulses and multiplicities. Our Deep Zoo is the place from which we dream. It is this place from which you came, the place from which you interpret the world, the place from which you create. As Gaston Bachelard, Rikki Ducornet’s favored philosopher, says, “daydreams illuminate the synthesis of immemorial and recollected. In this remote region, memory and imagination remain associated, each one working from their mutual deepening.” The Deep Zoo galvanizes us. It is potency. Ducornet writes by her own charges: there is alchemy aplenty inThe Deep Zoo. The collection comprises fifteen short essays, each of which offers up a roiling stew of subjects: from Werner Herzog’s film The Enigma of Kaspar Hauser to Gaston Bachelard’s architectural poetics; Egyptian mythology to American politics; scientific principles to the author’s childhood memories. Ducornet moves between these facets of human experience with otherworldly grace, creating surprising parallels and associations. For instance, after describing the aromatic topography of Wan-Ming’s palace in China (“One found one’s way by smelling distinctly fragrant things that filled large basins set out in each room … The children never tired of inventing and navigating new itinerates blindfolded”) she moves into speculative metaphysics (“hyperanimation and virtual reality … that evoke and subvert known physical bodies”). The result is a kind of kaleidoscopic reading, one that mimics the natural movements of human consciousness. What we are given as readers—as guests in Ducornet’s own Deep Zoo—is an invitation to witness her mind at work: a chance to walk through a menagerie of insights. The writings of Rikki Ducornet elude easy description. Her fiction draws from folk tales but takes them into stranger places, finding subtly experimental takes on narratives that at once echo and defy the familiar. The Deep Zoo, then, is a collection of essays on topics ranging from contemporary art to mysticism, as well as a meditation on society and certain ornate tendencies in fiction. In the title essay, Ducornet cites the writings of Julio Cortázar, Clarice Lispector and Italo Calvino; later in the book, she also will invoke the films of David Lynch. What they all share is a constantly shifting aesthetic and a disregard for narrative traditions, whether cinematic or literary. It’s this milieu that Ducornet seeks to explore. Click here to hear the playlist. 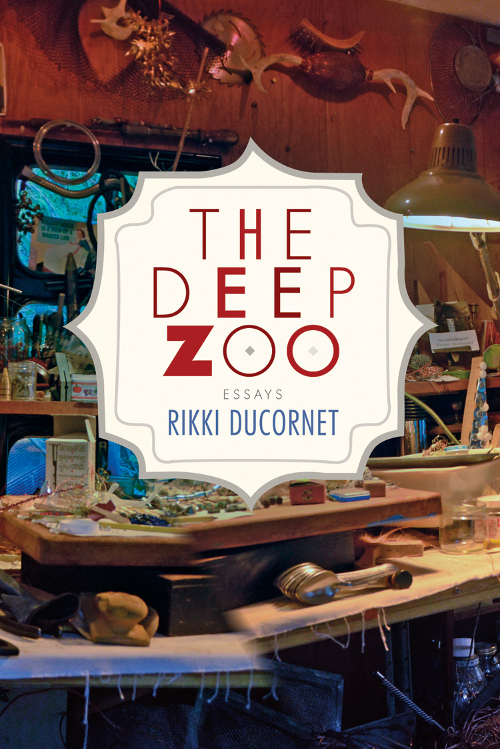 In her essay collection The Deep Zoo, novelist, poet, and painter Rikki Ducornet makes glittering connections between art, nature, and myth, beading them upon a string of deeply felt personal inquiry. Allusive and sometimes fragmentary, these essays take the form of crystalline observations, attuned to the pleasures of both language and thought. The collection begins by reminding us that in the tradition of Islam, the sacred exhortation Read! was the first word revealed to Mohammed. Accompanying this is the idea that “the world is a translation of the divine and its mirror.” Writing and reading are both acts of revelation, both tied to initial creation. The Research Notes series invites authors to describe their research for a recent book, with “research” defined as broadly as they like. Click here to read Rikki's full notes. Ducornet reminds us that our position in the universe reflects our imagining of it and that as a consequence, we should be wary of those who attempt to cordon this spark. This is a valuable, possibly even necessary, lesson made more powerful by the beauty and terror of The Deep Zoo. Read more at The Improbable. Over the course of eight novels, four short story collections, seven books of poetry, and two collections of essays, Rikki Ducornet has created a biological literature. Language gathers in her work with the joyful superabundance of the natural world; her rich vocabularies seethe and writhe with a corporeal life of their own, dreaming and breathing and creating heat. Given the closeness, here, between language and a kind of biogenesis, it is clear that, for Ducornet, literature is a form of science, a way “to propose a reading of the world and to reveal its potencies.” By potencies, she means what Gaston Bachelard termed the “mysteries of matter”—its natural powers, or what she calls, in the title of her latest book, The Deep Zoo. Read more at The Boston Review. The Deep Zoo is not didactic, but wise; not zealous, but possessed with great clarity of thought. It is simply a seed, willing to be planted on fertile ground and blossom as it is tended—and like the seed, it is mutable, shaped by its resonances with its reader’s own sympathies or secret impulses. Read more at Jeff VanderMeer's Weird Fiction Review.